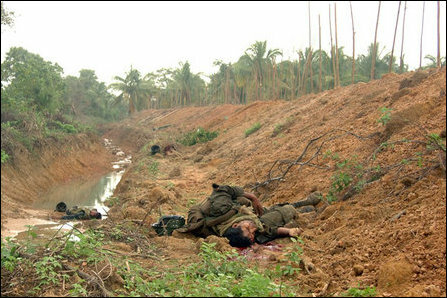 More than 60 SLA soldiers were killed and 12 SLA bodies recovered by the Liberation Tigers of Tamileelam (LTTE) defensive units, 5 km west of Ki'linochchi Wednesday after defeating the SLA formations that attempted to advance from Oottuppu'lam to Puthumu'rippu, Tiger officials said. At the same time, a heavy fighting broke out at A'riviyal Nakar, south of Ki'linochchi, where 29 SLA soldiers were killed in the clashes. The Tigers have seized four AK-LMGs, two PK-LMGs and eleven T-56 assault rifles with ammunitions in the clearing mission at Puthumu'rippu Wednesday afternoon. 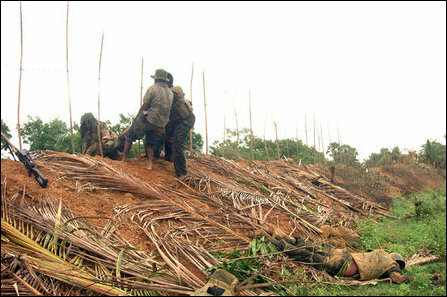 More than 180 SLA soldiers were wounded in both the clashes, according to the LTTE officials, who did not release any details of their casualties. 120 SLA soldiers were wounded in Puthumu'rippu, where the fighting was intense till the SLA was pushed back, they said. Heavy shelling was reported in Ki'linochchi town and its suburbs Wednesday. Sri Lanka Air Force (SLAF) fighter bombers were also engaged in bombing Forward Defence localities of the Tigers. A low-intensity fighting was continuing at Ariviyal Nakar. 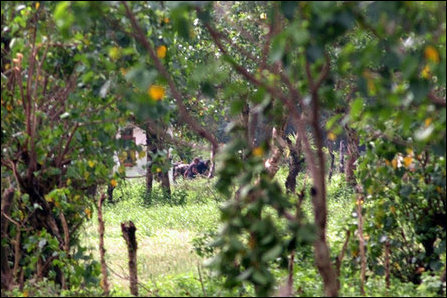 There were many dead bodies of SLA soldiers lying inside the no-go zone between the LTTE and SLA defence lines in Puthmu'rippu and Oottuppulam, according to the LTTE. 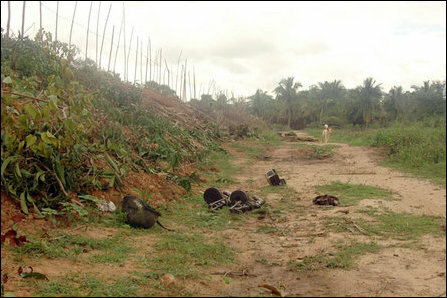 11.12.08 SLA death toll hits 120, army pushed back to Malai..